Now you can own a great looking Elon Musk pillow. The throw pillow is square and is available in many sizes and is available as a full pillow or as just a pillow case. 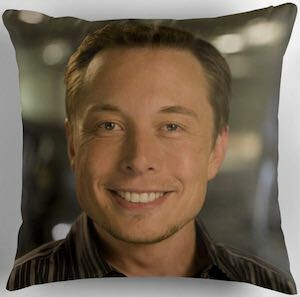 On the pillow you can find a happily smiling Elon Musk and I think he is just happy to be hanging out with you instead of sleeping in the Tesla factory. An Elon pillow is a great addition to your home for on a chair, couch or even the bed. If you are a big fan of Elon Musk and like a nice pillow then you just found what you need.